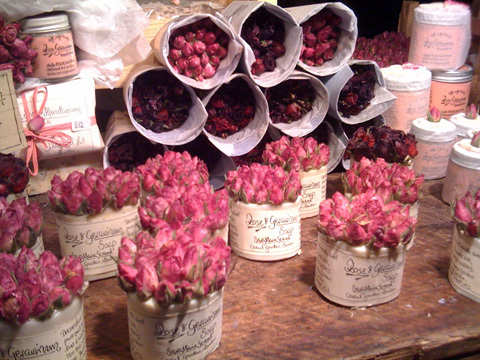 I was in London yesterday and found a beautiful handmade soap stand at the Covent Garden Market. These soaps are available everyday from Covent Garden Market on the East Piazza opposite Russell Street. I spotted these soaps because it was pitch black, the stand was all lit up and smelt fantastic. 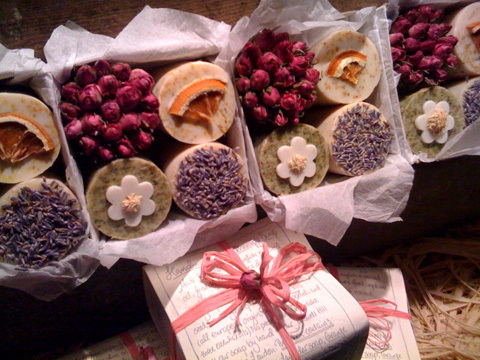 All her soaps were delicately decorated with dried lavender, dried roses, soap shapes and dried fruit. Although I was tempted by the beautiful rose and geranium soaps above, I left with a huge piece of speckled green Rosemary Marble soap. I asked for a business card and was presented with a small piece of nutmeg soap that smells (and looks) good enough to eat!. 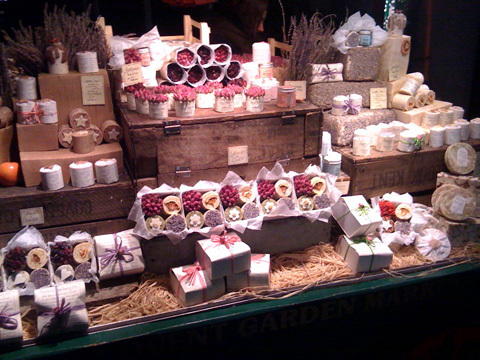 If your ever in Covent Garden, this little soap stand is well worth a look!! Next time I’m in the big smoke I think I’ll have to swing by!! 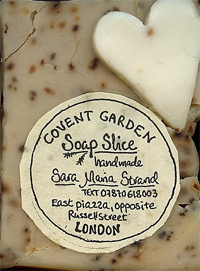 i’m italian and was in london last week end ,i found the stand very nice too, i’m trying to get in contact with …sara maria strand, i would like to buy more soap… but with the number on the soap bussines card… i can’t reach her from Italy… do you have an idea why there is writtem .. text and 07870-618003 and not phone ? searching with google did not help…. I bought soap last time I was in London. I love it. Does anyone konw if and how you could order online? dv posso trovare questi saponi on line? I haven’t found anywhere online that sells these soaps and they don’t appear to have a website. I think the only places you can buy them are at the Covent Garden Market or by calling them on +44 7870 618003.
tu pensi sia possibile ordinare telefonando? Has anyone found out if they ship overseas? I live in the US so it is the middle of the night there. I will try to call tomorrow and check. I see many have had no luck so I was curious if anyone knew. Thanks! I really do love this lady too and I still go and sniff my business card now my soap has been used up! My daughter bought me one of your rose and geranium soaps, and although it smells delicious, I don’t think it’s as it should be. The roses seemed rather mouldy, so I decided to cut them off and use the soap; but the rose stems have caused black staining, which runs quite a way down into the soap. Surely this isn’t what you intended. I’d appreciate your comments. Hi Suzie. We don’t make the soaps, we’ve just showcased them on our blog. 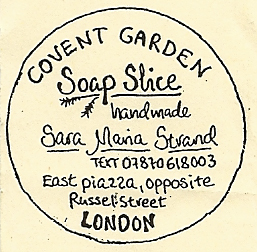 Sara Maria Strand don’t have a website, so the only way to contact them is via the phone number on the soap label. Hope you manage to get hold of them about your soap. Plants and petals naturally go brown in soap but they shouldn’t go black and mouldy. I have visited London last weekend and I bought soaps from that stand!I couldn’t resist!!!! !She does a great job! I make handmade soap myself and came across this blog while searching for soap displays. I agree that the stand in the above pics is just beautiful! I tried to enlarge these photos so I could see more detail, but the photos got distorted once I zoomed in on them. If anyone gets a chance to snap more photos of this gorgeous display, I’d love to see more (since I will never be able to travel there in person). Or if anyone hears that this lady gets a web site, I’d love to know about it so I could visit it. I really like the style in which she presents all her products. It’s especially interesting to me since I’m a soapmaker myself. It used to be a woman named C. Luka who sold these fantastic soaps. They still look exceptionally beautiful and I am sure they still smell just as fine. I’ll be there the next time I am within a mile of Covent Garden. Gorgeous soap! I was in London in January and bought some lovely items, only wish I had bought more!